Back by popular demand I have created more football Bingo cards. I had so much fun playing Ravens Bingo for both the playoff game against the Broncos and during the AFC Championship victory over the Patriots. I do realize that just because I live close to Baltimore and I am a HUGE Ravens fan, not everyone will be cheering for my boys during the Super Bowl. For this reason I decided to make a bingo card for each team. Rather than combine both teams into one card and have to put a marker on a negative Ravens spot, I made only positive cards for each team. It would be nice to have both types of cards at your Super Bowl party and let the guests decided which side they want to choose. It also adds another level of excitement while cheering for your team. If they do well, you get to add a marker on your teams Bingo card. 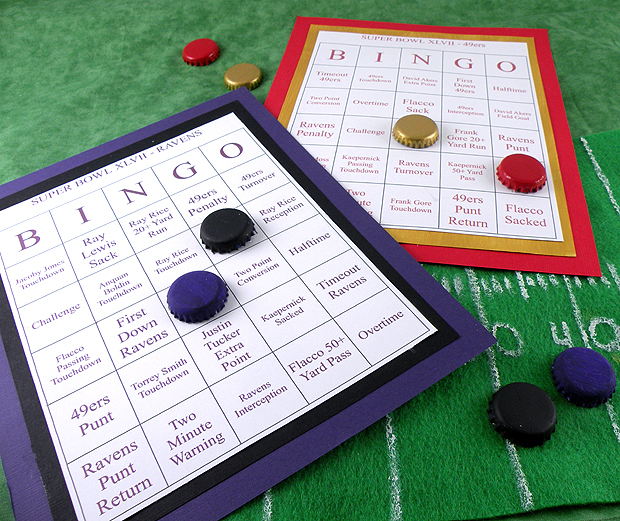 After you print the cards, cut card stock to matte the bingo cards to give them the team colors. I used bottle caps painted purple, black, gold and red as the markers. I used a Bingo card generator found at www.bingocardcreator.com. Enjoy your Super Bowl party and I have to say it…GO RAVENS!!!!!! This entry was posted in Uncategorized and tagged Gina Tepper, Ravens, super bowl, super bowl bingo, super bowl decorations. Bookmark the permalink.